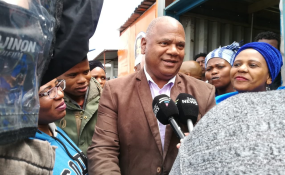 Cape Town Mayor-elect Dan Plato. Plato was elected by a majority, receiving 146 votes in council. Six ballots were spoilt. The other nominees were Xolani Sotashi from the ANC, and the ACDP's Grant Haskins, who received 53 and 3 votes respectively. After some delays confirming the number of voting councillors present, 208 ballots were cast via secret ballot at Tuesday's special council meeting. There were eight apologies. Plato now takes the reigns of the City of Cape Town for the second time. He was sworn in as a councillor last week on November 1. Those in the public gallery included Human Settlements MEC Bonginkosi Madikizela, who is also DA Western Cape leader. Former mayor Patricia de Lille last Wednesday announced her resignation as mayor as well as a member of the Democratic Alliance. It's a return to the city for Plato, who replaced Helen Zille as mayor in 2009, when she became Western Cape premier. De Lille then took over from him in 2011, and Plato became the Western Cape MEC of Community Safety. Last week, DA chief whip Shaun August and DA councillors Suzette Little, Siya Mamkeli, Greg Bernardo, Thulani Stemele and Brett Herron also resigned. Speaker Dirk Smit laid criminal charges against De Lille and former mayoral committee member Herron last Tuesday following the city council's adoption of two reports by Bowmans into maladministration in the metro during a council meeting last week. De Lille lodged an application in the Western Cape High Court on Wednesday to set aside the resolution, claiming the two reports were contradictory. She claimed one cleared her and the other recommended she be criminally charged.